Nose: Sweet and very slightly gingery. Right on the heels of that is some sweet, minerally peat, but not much smoke (well below normal Bowmore’ish levels, I’d say). Gets a little more acidic with time, with some pepperiness and also some floral hints (almost like floral talcum powder). With time the peat gets more peppery and less sweet and comes to the fore. There’s some mild ash/soot in there too now. With more time there’s some musky/sweet lemon peel as well and also an expanding creamy note. Let’s see what water does: it brightens the lemon up, giving it a minerally, peaty shading on the edges. Palate: Sweet and peppery with the peat manifesting itself more with mineral sweetness than with smoke–in fact, smoke is not particularly palpable here. A rather austere and narrow profile, in a way reminiscent of some northern Highland distilleries. The lemon emerges late on the palate as well. Much later there’s some dry, acidic smoke, but it’s dryer than it is smoky, if you know what I mean. Water makes it sweeter at first but there’s more intense ash/soot now (relatively speaking). Finish: Long. Starts out sweet, and then gets peppery. At the very end, finally, there is a very mild ashiness. Water doesn’t alter the finish very much. Comments: This is really very nice but, as with the recent Longrow 14 and 18, it is a stretch, I think, to call this heavily peated (does anyone know what the ppm levels are?). There is certainly peat but it is not at all overbearing, and those who are peat/smoke-phobic should not fear it in the slightest. Indeed, while the smokiness emerges with time–it’s barely palpable at all at first–this is not at all smoky or phenolic in the way of peated Islay whiskies or even highlanders like Ardmore or Benromach. 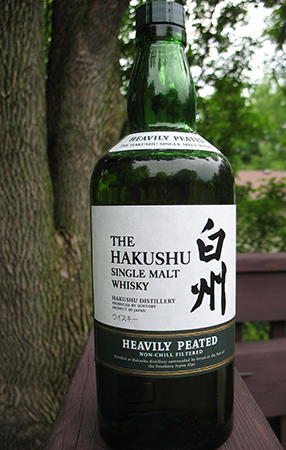 If you’ve had the Hakushu 12 and liked it do give this a shot if you come across it on your travels or if it does in fact come to the US. U sure this is the 2012 release? I think the 2012 bottle has the words “Bottled in 2012” on the front label. Not that I think it matters much since they make pretty consistent products. Um, I *think* that’s what TWE’s listing said when I got it; or am I confusing it with the Hakushu Bourbon Barrel that I got at the same time and which was definitely listed as the 2012 release? Okay, you’re right: as per Nonjatta, the label does say “Bottled in 2012”, and more importantly, the 2012 release came at the end of June which was after I purchased this bottle. Now, the question is whether my bottle of the Bourbon Barrel is also pre-2012…. So, it appears the Heavily Peated is coming to the US after all, but only at 43%. Good news and disappointing news all at once.